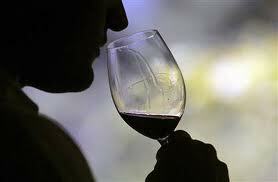 An Australian study finds red wine consumption decreases bone loss in men over 50. Milk builds strong bones, but apparently wine helps keep them. According to an Australian study recently published by the European Journal of Clinical Nutrition, red wine contributes to stronger bone health in older men. The researchers found links between improved bone mineral density (BMD) and red wine consumption in men aged 50 to 80. Bone mineral density refers to the concentration of minerals, like calcium, in bones and is a measure of bone strength. As BMD goes down, the risk for developing osteoporosis goes up. According to the Surgeon General’s last major study on bone health, 44 million Americans currently suffer from osteoporosis and half of all Americans over 50 will have weak bones by the year 2020. There is a long-established connection between excessive drinking and increased bone fractures due to osteoporosis and falls, but research on moderate drinking has found mixed results. The new study, which followed nearly 900 men and women over a two-year period, considered the benefits and detriments of beer, red wine and spirits on men and women.